Rabbits Eye View Big Sand, Gairloch, Scotland. On a particularly fine winter morning I drove out to Big sands at Caolas Beag, Gairloch a gorgeous sandy bay backed by high dunes. 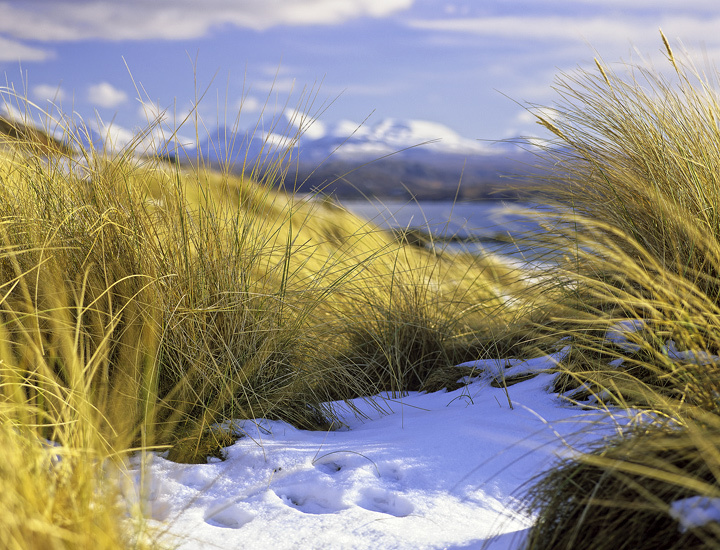 It had snowed right down to ground level and the dunes were frozen solid with patches of snow lying between yellowing stems. I made my way over the dunes to find a dozen or so skittish rabbits dash off to their secret tunnel hideaways and I couldn't help feeling envious of the very fine view on their doorstep. When I dropped down to rabbit level the view was even better, with the snow dusted Torridon peaks providing a stunning backdrop through a haze of spun gold.